19th November 2014 – If you can’t jump high, you jump higher next time! Reduce, reduce, reduce! Congratulations to Ling in successfully convincing us to eat less meat with his well researched CC7 speech! Did you know that on the average, a Malaysian consumes about 50 kilograms of meat in a year? An American on the other hand, consumes about 100 kilograms meat in a year! Research has also shown that those eating too much meat have a 20 percent higher risk of developing cancer and other diseases. Therefore Ling urged us to start reducing our meat intake from the current level that we enjoy now to the level our body really need. His final message is clear: by reducing our meat consumption, there are great benefits for our earth, for our children, our own health and reduction of cruelty to animals. She promised it will be an experience of the lifetime, a chance to expand your horizon and also to be in a team of pioneers. Have you sign up for the great event yet? 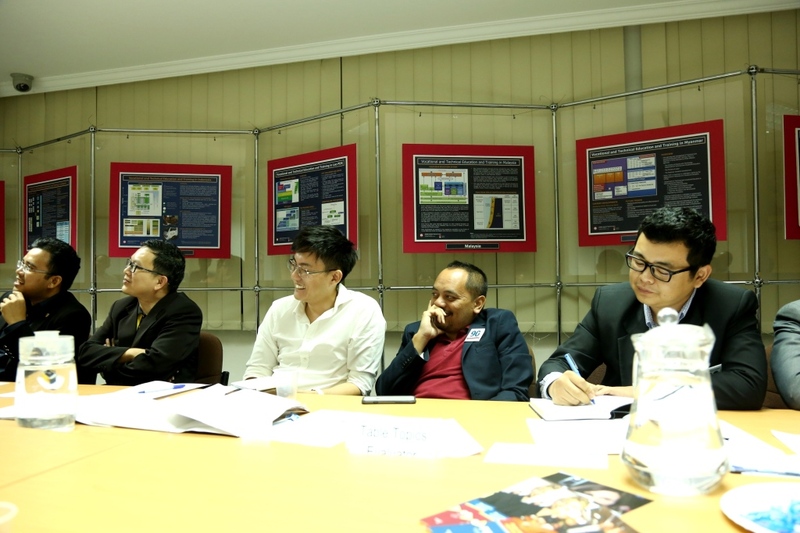 Genevieve will be organising a joint dinner meeting and a joint Executive Committee training session at Labuan, for this upcoming 10th and 11th January! In her speech, she has also explained how Area K6 was formed, and how Brunei was brought together with Labuan to help all members to progress. She also assured us that this is a great chance for us for us to go beyond our comfort zone! This is because we will be evaluated by other Toastmasters from Labuan, and a great opportunity to learn from each other. Genevieve has also estimated that we would only need a budget of $100 for this trip! What a bargain for a great educational experience and great fun! Definitely worth the money! What are you waiting for? 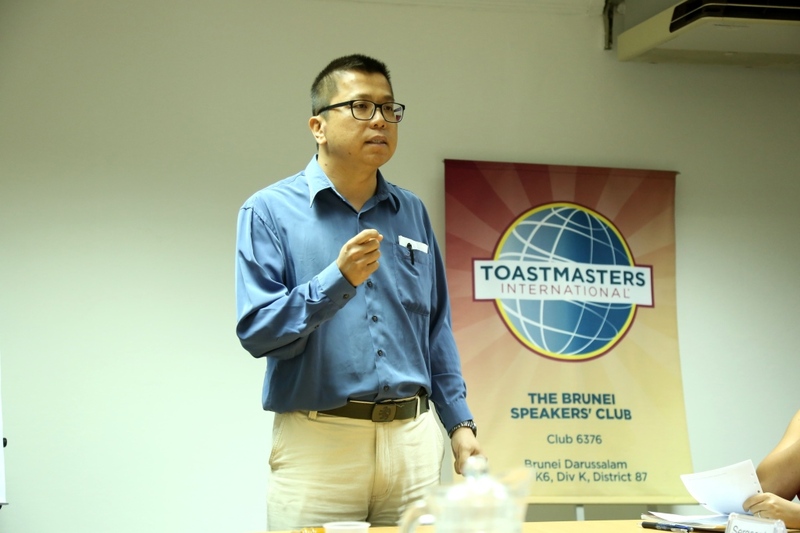 Thank you Kevin Koo for giving us a very evocative table topics session! You can’t run fast, you run faster next time! You can’t jump high, you jump higher next time! With all the motivations that Chris gave us, there is no doubt that Chris can be a very good basketball coach! You do what it takes to be better. If you have a problem, file it & move on! Thank you Chris! Serene has to apologize to her fan for cancelling her concert. But guess what great news to follow? She will give everyone here new CD for free! What is even better is that she will extend her concert from 3 days to 7 days so that she can have more time with us! The audience definitely can feel the excitement and deep down inside I actually hope that it is real for one second. Well done serene! Amran was asked to negotiate with his business partner so that he won’t leave him. Amran is upset that his business partner even thought about leaving him in the first place, considering the fact that Amran paid him so much! What’s so touching is that Amran didn’t get mad and told him to think million times before leaving him. This is what you call unconditional love. Good job Amran! 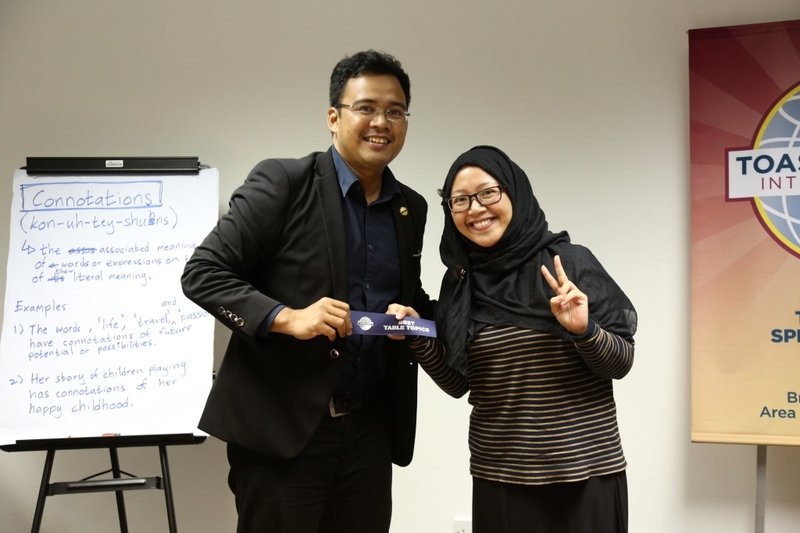 Congratulations to our guest, Nadjwah for getting the best table topic speaker! She wowed the audience by her creative and humorous response. She was asked by the boss to order the subordinate to stop using any kind of social media applications while working! Instead of being a dictator, she advised her subordinates that using social media is fine, but just don’t get caught! Who would have thought that’s what she would say! Congratulation once again! Bob had to convince his boss to approve his leave when his leave has been cancelled. Guess how did he do it? He played the guilty trick! He actually caught the boss having a mistress and even wants to threaten to scratch his new car if no immediate actions are taken! Bob! Your leave has been approved! Last but not least, Seng Yee was given a topic to convince her boss to not cut the company budget. With her quick thinking, she praised her boss for his perceptiveness, intelligence and understanding ways. Through her subtle messages, her boss would definitely understand the consequences of cutting the budget even without having her explicitly telling him so. Guess what is so funny? There were a lot of first timers carrying out the office bearers’ roles. 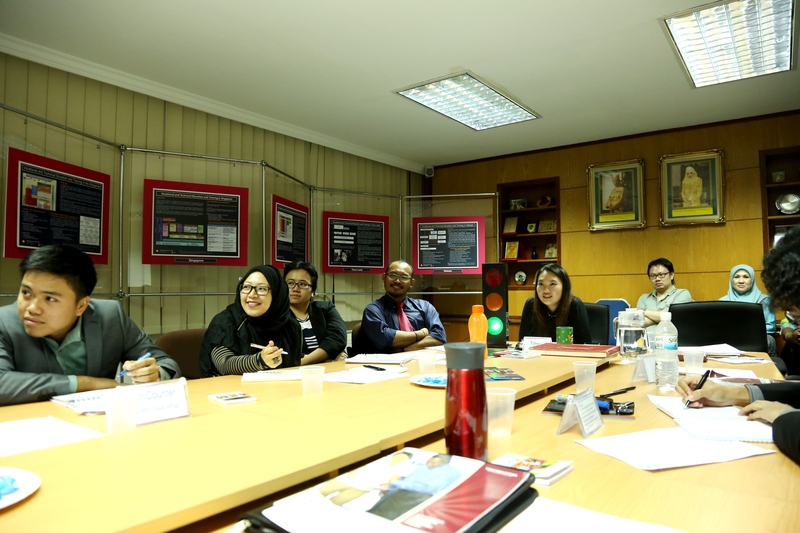 Despite this, the quality of the meeting was maintained, and the meeting was superb. A special thank you and well done for the first-timer, all of you did an amazing job! 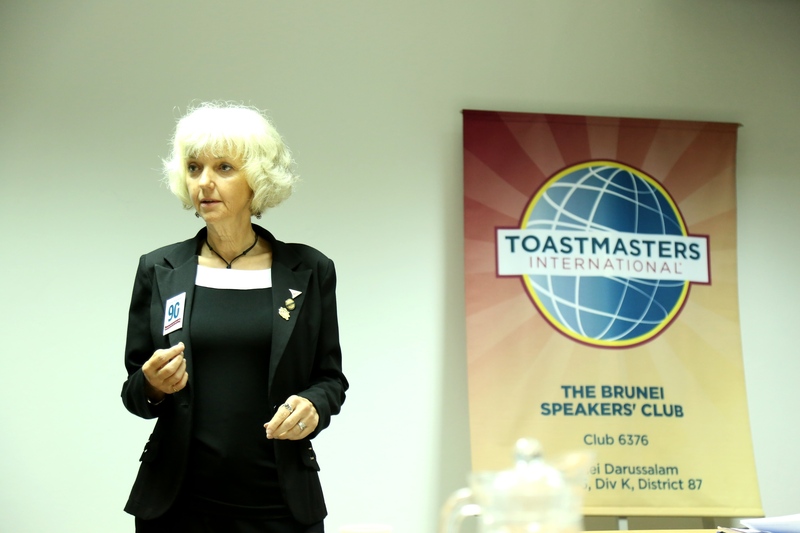 Well done everyone, and especially to Donna our Toastmaster of the Evening! It has been a long time since Clovis take up a role as General Evaluator. So thank you Clovis! It was such a great night. Thank you everyone who attended and participated in making it such an awesome meeting.